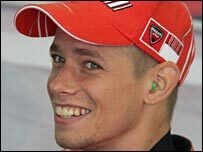 World championship leader Casey Stoner will start Sunday's Czech MotoGP from pole position after qualifying fastest in Brno on Saturday. Defending world champion Nicky Hayden was second, ahead of Repsol Honda team-mate Dani Pedrosa in third, with Valentino Rossi in sixth. Stoner's fastest lap time was one minute 56.884 seconds, recorded on the 13th of his 14 qualifying laps. None of the other top 10 riders rode less than 20 laps for their best time. Stoner, 21, has already claimed six wins in 11 races this season - in Qatar, Turkey, China, Catalunya, Great Britain and the United States. But his new Ducati team-mate next season, Marco Melandri, missed the session with a trapped nerve in his neck and has also been ruled out of Sunday's race.